Happy Sunday to all despite the gloomy weather outside. Hope everyone is safe so stay indoors and relax while reading your favorite blogs :) Anyhoo, here's a review of another promising skin care product that I've been using for three weeks now. If you're the type who likes to see fast results then read the whole review so that you'll understand why I'm starting to like it even though I enumerated three negative things about this so called hand and body cream. Yes, it's a cream form of lotion. I presume what you have in mind now is the cons of using this product. In my honest opinion, cream based lotion is a no no especially in our humid weather, right? But there's another way where you can still use this type of lotion and see results immediately. Have you heard of COSMO Skin? If not, click HERE and HERE so that you'll have the idea of what this brand has to offer. I've known this brand some four years ago and tried their soap more than once. If I've been blogging during that time, it's a sure thing that I'll be raving it over and over again. I've also tried their Grape Seed Extract supplement and I can say that it's a better alternative to Vitamin C because it has more anti-oxidant properties than Vitamin C alone. So lets go back to star of this review! At first I have a love-hate relationship with the product but after a week it's all L-O-V-E! Now I'm telling you to click CONTINUE and enjoy reading! Advanced Whitening and Nourishing Collagen specially developed for the needs of Asian Skin. Formulated with Advanced Skin Whitening Technology for extra fair and radiant glow. Its Marine Collagen, Arbutin and Vitamin C have 50 times anti-aging and whitening power. Cosmo Skin Collagen Hand and Body Cream is a unique cream based lotion that is ideal for use in the hands and the body. It has collagen, Alpha Arbutin and Vitamin C that helps keep skin glowing, healthy and moisturized. See how thick the texture of this cream based lotion is? 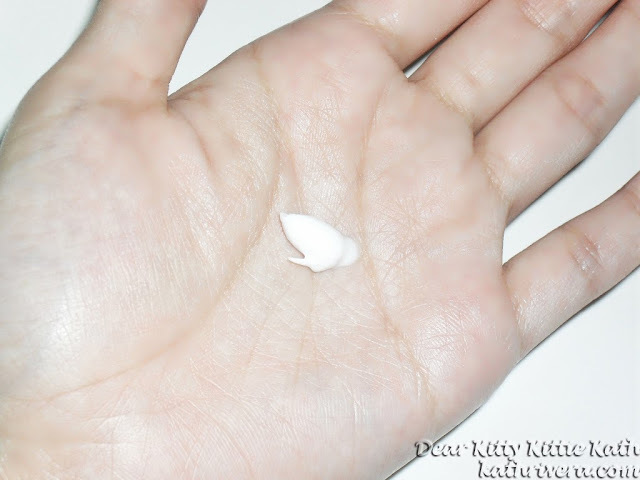 It's very hard to spread at first but once you've applied it on your skin, it will glide smoothly. Just exert a little effort but do not over rub it. instructions for use: Apply liberally on the whole body. Use regularly. ingredients: Aqua, Paraffinum Liquidum, Stearic Acid, Glycerin, Cetyl Alcohol, Propylene Glycol, Glyceryl Monostearate, Dimethicone, Triethanolamine, Perfume, Marine Collagen, Arbutin, Ascorbic Acid (Vitamin C), Methylparaben Propylparaben. The scent is not overpowering. Smells like powder fresh scent. Contains powerful ingredients like Arbutin, Marine Collagen and Vitamin C, anti-aging and whitening in one. Since it has thick consistency, it takes time to be absorbed by the skin. If used during daytime, I find it sticky and heavy on my skin. I give this lotion a 4.75/5 rating. This is my first time using hand and body cream all over my body. I was losing hope during my first three days of using the product because I find it heavy on the skin and the thick consistency gave me a hard time spreading the cream on my legs and arms. But after a week of using the product, I decided to use it every night and lather the cream right after taking a bath. I find this ritual more effective and effortless. If applied during day time, I find the product sticky and heavy on skin. BUT nonetheless, it's VERY EFFECTIVE! Have you tried Cosmo Skin products? Share your thoughts and have a great day ahead! Siguro nga pang night time lang ito because of the thickness and lack of spf. Happy to know that it worked on you. Whoa it lightened your insect bites? I've been on a search for products like this one! Will try it out! Thanks sis! P149 is a good deal for a whitening product plus it smells just right too. @Almari- yes :) ang bilis talaga. @Franc RAmon- yep, affordable and effective. @Czjai Reyes-Ocampo- yup, kaya ganda ng benefit sa skin :) check it out sis ha. @itsmefati- that's the only downside but you can make it work pa din. @Mish R.- hello, yup try this and yes mas advisable sa gabi. @Angel Feliciano- yup dear, mas magiging heavy syo to. @Leilani Gamboa- try one na and let me know. I suggest you have a look at products made from the Anti-Aging Collagen Cream. It contains ingredients to act as anti wrinkle and anti aging cream, at the same time stimulates skin regeneration and replenish daily moisture loss. Meriance is rich in Amino Acids and minerals, stimulating skin rejuvenation with the effect of a smooth, soft and healthy skin. another knowledge..thanks for sharing....parang gusto ko sya itry gamitin..